Mansfield Energy announced last week that the company is seeing a rise in risk management activities from customers in response to rising fuel price volatility. 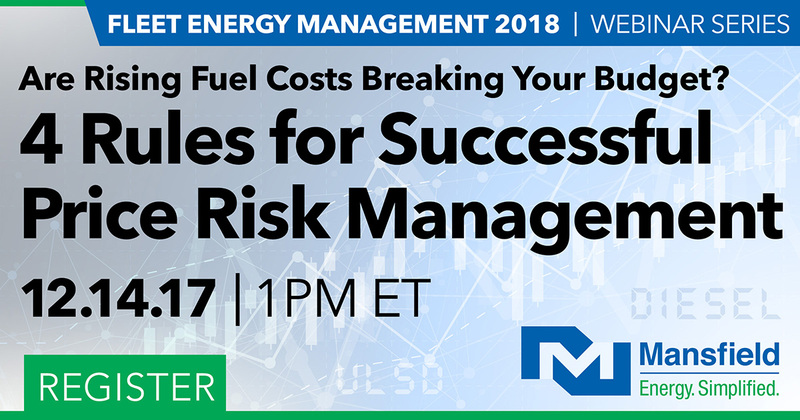 Jay Blanton, Director of Risk Management Solutions, notes, “Although prices were calm through much of 2017, the end-of-year trend has been towards greater volatility and unpredictable price movements.” In response to the rise in price volatility, Mansfield is hosting a free webinar with some simple rules for managing fuel price risk and protecting fuel budgets. Click Here to read more from Business Insider, and Click Here to register for the webinar. According to market research group Rystad Energy, U.S. oil production will be much higher in December than official EIA data suggests. The EIA points to a slowdown in August production to show that higher production cannot be sustained. Rystad, on the other hand, attributed that slowdown to maintenance on Alaskan oil fields and Hurricane Harvey; in their estimation, total production capacity is 300 kbpd higher than actual output, giving significant upside room for growth. Overall, the group expects U.S. production to reach 9.9 MMbpd by the end of 2017. Click Here to read more from Rystad Energy. Forecasting is not a perfect science, which is why we’re following the Rystad article with an opposite prediction – an MIT Study shows the EIA data overstates production forecasts. The EIA relies on improving technology to deliver improving well productivity. According to MIT, lower prices have simply forced producers to tap the easiest and most accessible wells, leaving more complex and hard to extract wells for the future. If this is the case, then U.S. oil production is much more limited over the long-term than official data suggests, which could mean sharply higher prices a few years from now. Click Here to read more from MySA. As market enthusiasm fades following OPEC’s deal extension last week, analysts are now looking to 2018 and what happens if the deal is successful. Many analysis groups say inventories will be down to 5-year averages by mid-2018 – what happens if markets are under-supplied after that and prices spike? OPEC is trying to thread the needle, keeping prices high while not giving U.S. producers too many chances to grow. OPEC and Non-OPEC signatories agreed to meet in June to review whether the deal should be revised halfway through the year. With that in mind, last week’s agreement was just further delaying the coming question – after a year of production cuts, how will the deal finally end? Click Here to read more from Bloomberg and watch their video on market conditions. Will Electric Vehicles Put an End to Gas Cars? Electric vehicles are all the rage, but will they displace current internal combustion engines (ICE)? Opinions vary. Some market participants believe virtually all light-duty vehicle miles by 2030 will be in an electric vehicle, while others believe that infrastructure limitations and cultural factors could slow that forecast significantly. Click Here to read an interview among several transportation analysts on how long electric vehicles will take to penetrate U.S. markets.